Thanks to the miracle of modern medicine and the best part of a week in the hospital followed by at home IV antibiotics, I’m feeling much better. Home is always good with the ability to have a cup of tea whenever you like, your own bed and pillow, and the ability to spend your time in between antibiotic injections doing something relatively fun. 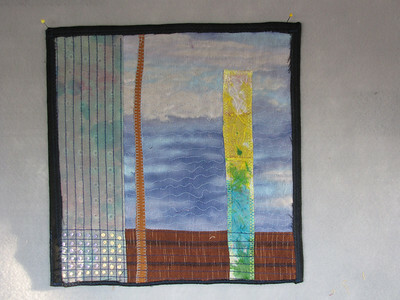 For me, that is spending some time in my sewing room which remains packed to the brim with projects half started. The mechanism involved is rather interesting, resembling a large lumpy softball with caps on two ends. 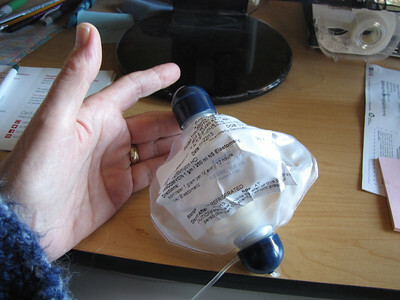 There is no electricity involved, just a balloon that releases the medication at a set rate. It is nice, I can go upstairs or run to the bathroom or out to the kitchen or for a tissue without figuring out how to drag an IV pole and heavy pump along. Most of the time I sit on the couch downstairs and we watch a Netflix movie or a Star Trek. Glen has decided to weigh the devices pre and post infusion to see when the infusion is completed. Yesterday I worked on a Fast Friday Challenge depicting infinity. The group is an off-shoot of Project Runway in which a challenge with parameters is issued with a one week timeframe for completion. Of course, we are not very rigid about this time-frame and no-one gets kicked out of the group but it does make for stretching and venturing into unknown territory. This is made from two pieces of silk that have been overdyed and printed, cotton ikat, and a commercial sky fabric. Being able to see a wide horizon with the perpetuation of seasons indicates infinity to me. PawPrints: Toby has been most confused; first I was no longer at home, Glen was spending most of his day at the hospital with me, and she was convinced she had done something wrong to create this situation. That lasted about a day and she was back to her usual self. When offered her pancake as part of the breakfast we share, she first placed it in a box containing newspapers near the back door. Then when she noticed that I was in the room when she did this, she quickly retrieved it and hid it under her floor pillow. In her younger days she would try to push the pillow over her toys or bones–thinking it’s brown color meant it was dirt. No place like home, is there? We miss seeing you at Studio 105.